September 11, 2017 — Links International Journal of Socialist Renewal — At the press conference to announce his run for President in 2016, Donald Trump referred to Mexican immigrants as “drug dealers, criminals, rapists” who must be stopped by “building a wall.” Since taking office, Trump has continued to reiterate that message through policy initiatives designed to further degrade the quality of life for undocumented workers and their families. 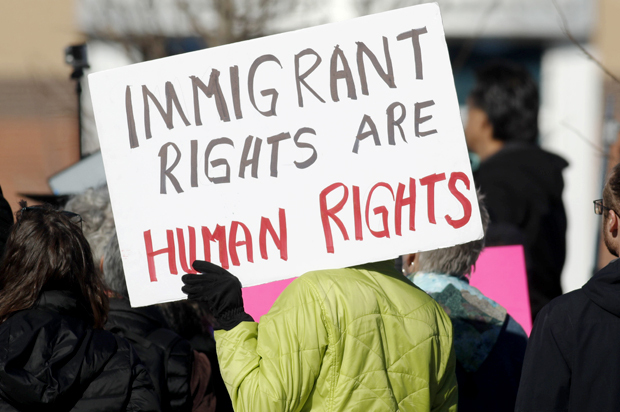 The overtly racist targeting of migrant and immigrant people by Trump has excited the far-right, and emboldened their efforts to organise and mobilise on a national scale, and terrorise working class communities of colour. March 18, 2017 — Links International Journal of Socialist Renewal reposted from Left Unity — This is the third of Ernie Tate’s letters to Left Unity detailing and analysing the struggles against Trump as they emerge on the other side of the pond. Ernie is a lifelong revolutionary who emigrated to Canada from Northern Ireland as a young man. He was one of the most important activists of the Vietnam Solidarity Campaign in the 1960s and has recently produced a two volume memoir, “Revolutionary Activism of the 1950s and 1960s”. A by-product of present toxic atmosphere in the United States against immigrants and refugees has been a sharp increase in this country in recent weeks in the number of asylum seekers walking across the Canadian border, often placing themselves and their families in harm’s way from our extremely harsh winter. It’s also a consequence it should be noted, of the military interventions by the American empire in the Arab and African world — now greatly destabilized because of it, especially since the fall of the Soviet Union. And like everywhere else, reactionary forces here are attempting to exploit it to stoke up anti-immigrant and anti-refugee sentiment. March 2, 2017 — Links International Journal of Socialist Renewal reposted from We Are Many— As Trump enters the White House, millions of people are looking for a way to fight back against what is sure to be an all-out assault on the rights of women, people of color, the LGBTQ community, immigrants, and the working class as a whole. Our effectiveness in the struggle ahead requires clear strategy and tactics and a commitment to work together to cohere a strong socialist pole of attraction within the emerging movements against oppression and austerity. Following the historic national mass mobilizations taking place during the inauguration weekend, the Democratic Socialists of America, the International Socialist Organization and Solidarity invite you to join us for a comradely discussion and debate on the next steps for socialists in the Trump era. 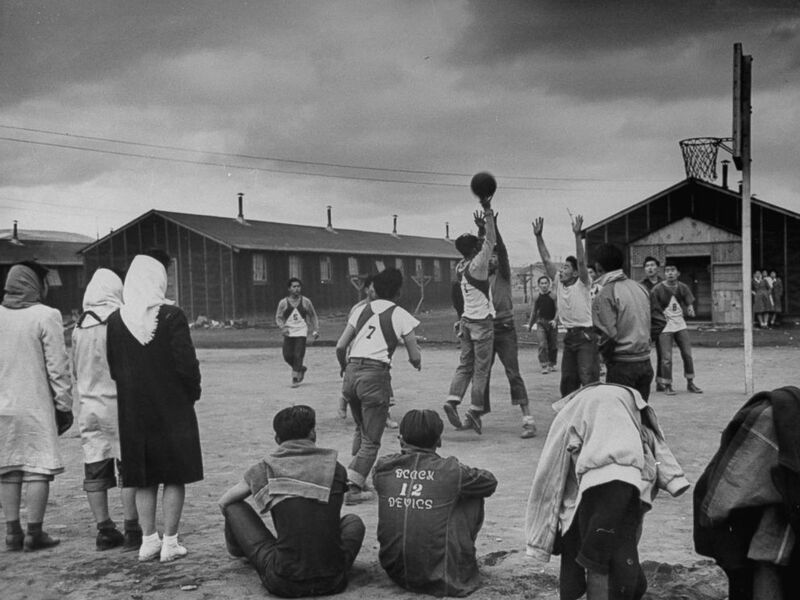 Young men play basketball at a Japanese internment camp in 1944. January 6, 2017 – Links International Journal of Socialist Renewal reposted from Antipodean Atheist with permission – There are many analyses of the incoming Donald Trump administration examining the reasons for his electoral victory, the racism and Islamophobia that he deployed to win votes, his populist appeals to the American working class, the emboldened position of the “alt-right”, and the ultra-rightist nature of his incoming cabinet. It is no exaggeration to state, for instance, that his chief-of-staff, the man Trump turns to first for political advice, is an outright fascist. It is not difficult to ascertain that the leading personnel of the Trump regime, composed of billionaires, ex-generals and ultra-rightist psychopaths, are going to make life harder for the US working class – and by that I mean people of all racial and ethnic backgrounds. The implication is clear - the so called crisis of immigration is an indication of a bigger moral crisis in the wealthy countries of the world; those societies that have resources to help those who are in severe danger and to mitigate or resolve the circumstances that lie at the roots of their flight. Reflection on these matters is essential if we are to face the moral crisis honestly and realistically, which is a prerequisite to a humane and constructive response to an enormous human problem that is right before our eyes, and is very likely to become far worse in the near future unless decisive actions are undertaken. And it is instructive, I think, to reach for these reflections, to reach beyond the events, that are before our eyes which are shattering enough. That includes the report in yesterday’s El Pais that more than 4,000 desperate refugees have drowned in the Mediterranean this year, fleeing from misery and violence. Migrants are often in extreme danger as we see every day. October 27, 2016 — Links International Journal of Socialist Renewal — Currently, New Zealand has at least 150,000 people working on temporary work visas or as students with the right to work up to 20 hours a week or full-time when on vacation. Most of them have hopes of being able to transition towards permanent residence, yet official figures confirm only one in six is able to do so. Government policies have deliberately led to the creation of a huge pool of desperately vulnerable workers to help big business exploit them more effectively. Immigration policy under “free market” economies are designed to keep working people down – not out. While mainstream politicians routinely resort to subtle (and not so subtle) racist smears on migrants, government policies actually facilitate further migration. Capitalist “democracies” love to have large segments of the working class with no, or very few, rights – and that is true for New Zealand as well.